North Carolina’s Research Triangle sits on the fringe of the country’s most dangerous region for radon. Since the amount of hazardous radon particles can vary from house-to-house and its impact on health is considerable, it’s a good idea to have your home’s radon levels checked. 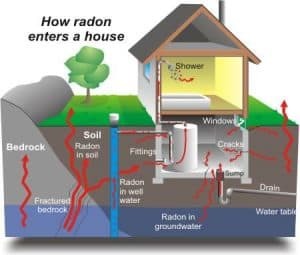 If you would like to learn more about radon in NC, please visit www.ncradon.org. Schedule your Radon Testing Raleigh Today! Detailed Home Inspections can give you the information you’ll need to eradicate radon from your home or feel secure by knowing it isn’t a threat to you and your family. Did you know that the United States Surgeon General and the Environmental Protection Agency both recommend radon testing for every home? A radon test is simple to conduct. In homes where high levels of radon are present, removal is also easy to accomplish. Ignoring the potential threat is never a good option. Indoor radon gas ranks as the second leading cause of lung cancer in the United States, so there is no need to take an unnecessary risk. If you are buying or selling a home, or have lived in your present residence for a while without this information, conducting a radon test is essential. Detailed Home Inspections uses qualified radon contractors in Raleigh, Cary, Apex, Holly Springs, Morrisville, Fuquay-Varina, Garner, Lillington, Clayton, Wake Forest, Durham, Chapel Hill and throughout the Triangle and central North Carolina region. Schedule your Radon Testing Raleigh Today! Please schedule your inspection or contact us to learn more about radon, by calling (919) 706-0098 or emailing inspect@detailedhomeinspections.com.